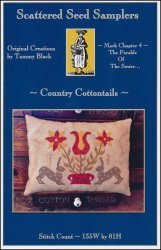 Country Cottontails [H5485] - $12.00 : Yarn Tree, Your wholesale source for cross stitch supplies. A cross stitch design from Scattered Seed Samplers. Bunnies are sitting on either side of a large pot of spring flowers. Stitch count 135w x 81h.